Want your YouTube ads to convert? Looking for effective ways to build remarketing audiences for your ads? To explore tactics for remarketing with YouTube, I interview Brett Curry. In this episode, I interview Brett Curry, CEO of OMG Commerce and a YouTube ads expert. He authored “The Ultimate Guide to Google Shopping” for Shopify. He’s also host of the eCommerce Evolution podcast. Brett explains different ways to combine search, shopping, and YouTube options to build target audiences that convert. 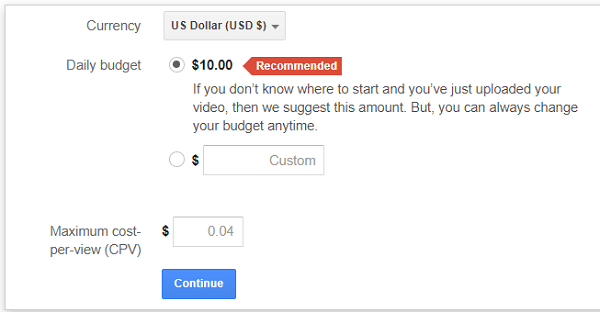 You’ll discover how to estimate the cost of YouTube ads and manage your budget. 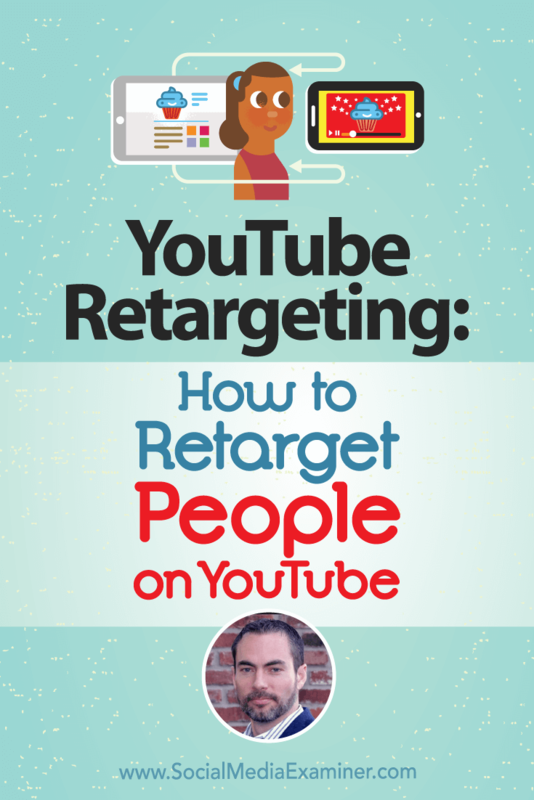 YouTube Remarketing: How to Retarget People on YouTube featuring insights from Brett Curry on the Social Media Marketing Podcast. Right out of college, Brett started a small ad agency. In school, he sold radio ads, but he loved the way local TV ads made an impact and created local celebrities. In 2004, Brett got into search and SEO, which led to building OMG Commerce in 2010. OMG Commerce is a full-funnel ecommerce marketing agency. At every stage of the funnel, the agency focuses on attracting the right shoppers to each client’s brand. To do that, they combine search, shopping, display, and YouTube ads. Brett thinks that search ads and YouTube ads are a match made in heaven and that YouTube ads create unique opportunities for remarketing. OMG Commerce helps attract shoppers at the top, middle, and bottom of the funnel. For example, OMG Commerce has a client that sells iPhone accessories. At the top of the funnel, if someone is looking at iPhone case reviews, the agency targets that person with a YouTube ad. Someone actively searching on Google for a specific product such as an iPhone 7 Plus screen protector will see a Google Shopping ad. When someone who clicks doesn’t convert, they begin seeing remarketing ads. Although OMG Commerce primarily uses Google products, Brett believes in using any kind of marketing that works. Also, connecting the dots at the top, middle, and bottom of the funnel is important. Brett’s agency makes sure clients have AdWords conversion tracking, Google Analytics, and the correct attribution model. Then the agency pulls together all of these elements so their clients see the impact. Listen to the show to learn how Brett’s company built their claim to fame. Brett says a lot of merchants getting good results advertising on Facebook want to know if they can do something similar on YouTube with the Google Display Network. The answer, for the most part, is yes. (Remember that Google owns YouTube.) Businesses usually want to do both YouTube and Facebook ads. Compared to Facebook, YouTube advertising has advantages. Facebook counts a video view after three seconds, whereas YouTube counts a video view after someone has watched for longer. With YouTube, a view counts after 30 seconds or the length of the video if it’s shorter (like a 15-second ad). That longer view time is a better measure of whether someone is engaged with the video. YouTube advertising offers several benefits. Plus, YouTube is expanding the ways you can target viewers. With in-market audiences, you can target people who are in the market for a particular type of product. For instance, if you work in the skincare business, you can choose people whose search patterns indicate they’re in the market for skincare products or services. With affinity audiences, you can target someone who’s into travel, food, or something else. Brett thinks one of the best options is the ability to target someone based on their search behavior because YouTube is the number-two search engine (behind Google). Search behavior offers great insight. For example, you can learn not only that someone is looking for recipes, but that they’re also interested in how to make coffee drinks. Listen to the show to hear my thoughts on why YouTube users watch video with more intent than Facebook users do. When most people think about remarketing or retargeting, they think about reaching someone who has been to their site but didn’t convert by buying a product, downloading a guide, or taking another desired action. When you remarket to this audience on YouTube, you run an ad only to those users, remind them of your offerings, and try to get them back. You might even give them a discount or coupon. However, Brett emphasizes that you can also remarket to people who watch videos on your YouTube channel. Moreover, you can segment these video viewers into people who have commented on a video, watched a particular video, watched any video, and so on. You can build lots of lists based on different criteria. There are a lot of ways to divide your YouTube viewers to remarket to them. For example, one of Brett’s clients is a large company that sells coffee syrup and does a lot of how-to videos such as “How to Make a Caramel Macchiato.” You can target people who watch the informational video with an ad for the syrup and include a discount. The key to good marketing is matching your message with your market. You need to reach people with the right offer at the right time. Targeting your YouTube video viewers does come with some limitations. To add someone to a list based on their video-viewing behavior, they have to watch to the billable point in the video (30 seconds or the whole video, whichever comes first). Beyond that, you can’t create segments based on how long someone has watched a video. For example, you can’t create a list of people who have watched at least half of a long video. 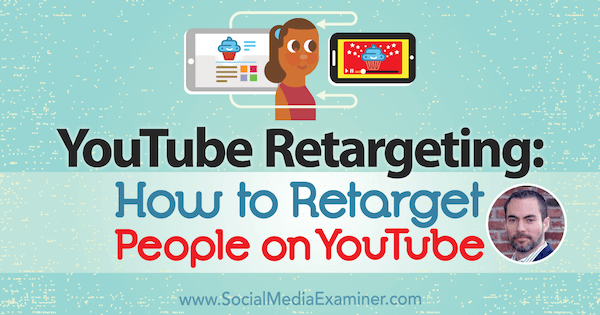 Next, Brett shares some of his favorite lists to build for YouTube retargeting. You can create a list as simple as All Site Visitors, which is anybody who’s been to any page on your site. For instance, because pumpkin spice latte season is a short window, his coffee syrup client would want to hit all website visitors from the past year or more and let them know pumpkin spice is available for a limited time. You can also look at product page viewers because they’re typically a little more engaged. Cart abandoners (people who added a product to the cart but didn’t check out) are another audience with high conversion rates. You can segment your ads for these audiences into 7-, 14-, and 30-day windows. There are many ways to create a remarketing list. Next, I ask Brett where these remarketing YouTube ads appear. Brett says the two different ad formats are in-stream ads (also known as pre-roll ads) and in-display ads (also called TrueView discovery ads). 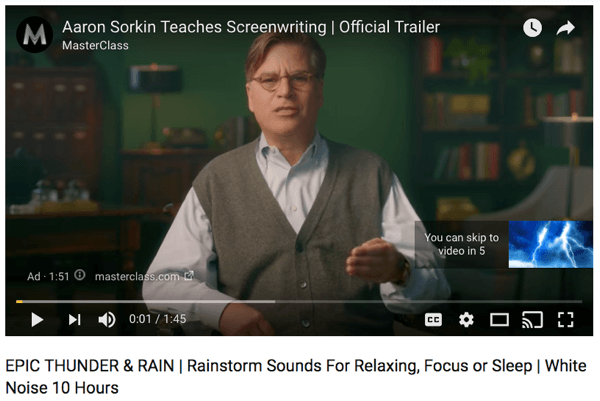 In-stream YouTube ads play automatically before the featured video a user wants to watch. The in-stream ads that viewers can’t skip are expensive so they’re typically only run by large corporations or brands. Most businesses run skippable ads and Brett says it’s actually good when people skip your ads. If viewers aren’t interested, you don’t want them to hang around because you have to pay for that impression. YouTube’s in-stream (or pre-roll ads) like this one run before the featured video plays. While YouTube’s in-display ads usually appear in the upper right in the YouTube interface on a desktop browser, the ads can also show up in search along with organic results. In-display ads are usually a thumbnail followed by two or three lines of text and are labeled as an ad. A YouTube user has to click an in-display ad to see the content itself. You have total control of where you put your ads. Choose in-stream, in-display, or both, which is what Brett likes to do. When you run both, Brett finds that in-stream ads get a lot more impressions (90% to 100%) because you can target videos and they autoplay. I ask about mobile versus desktop ads, and Brett explains you can do bid adjustments based on device. For example, if you choose to do a -100% bid adjustment on mobile devices, it would effectively block mobile traffic. If you use YouTube for either top-of-funnel or remarketing, mobile can still be effective because you’re either just trying to plant the seed or trying to get them to come back to the site. Listen to the show to hear my thoughts about making a complex sale on mobile versus desktop. With in-stream ads, a viewer has to watch a certain percentage of your video (it has to count as a view) before you’re charged for an impression. For in-display ads, someone has to click to play the ad (thus choosing to watch it), and a cost is associated with the click. You’re charged for in-display ads when someone clicks on your ad to play it. Your cost per view depends on a bid you place. Tell Google you’re willing to pay X amount per view (30 seconds or the whole video, whichever comes first). 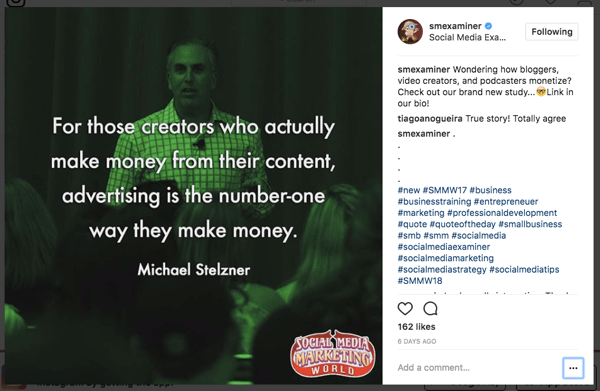 So if someone is watching the video for Social Media Marketing World and clicks the overlay that says Register Now, no matter when they click on it, we get charged for the click. (So we would pay the $0.05 to $0.09.) On average, Brett sees anywhere from $0.05 to $0.09 cents per view. Clients who are going after a broader audience can bid really low (below $0.05). I ask Brett if there’s a way to determine your total cost for an ad. Brett says that in Google’s reporting, you see how much you’ve spent overall, how many clicks the ad has received, and the cost per click. Also, as you’re planning a campaign, you can experiment with different scenarios and costs by using the AdWords planner. For example, you can tell the planner you’re willing to pay $0.04 per view. The planner will then estimate how many views you can get. As you build or upload your audience and change what you’re willing to pay per view, you can see what kind of impressions you can get based on your budget. It’s a handy tool. However, Brett emphasizes that your view rate determines the actual cost (not impressions). If you have a thousand impressions on the worst video imaginable and everyone skips it, you’re not charged for that. To help manage your costs, you can set a daily budget in the AdWords interface. You also want to look at the view-through rate, which is the percentage of people who see it who actually view it. If you have 1,000 views and you paid $0.04 per view, you may have gotten 15,000 impressions to get those views. You can also see reports that show what percentage of people watched 25%, 50%, 75%, or all of your video. With that data, you can begin comparing video ads and noting which ones are more engaging. Select a daily budget along with your bid. In your YouTube video, you can display a call-to-action overlay at any time and for as long as you want. With ad costs in mind, Brett typically places that overlay about five seconds after the video starts. In the first five seconds, the script might describe the target audience so people who aren’t in that audience can move on (and thus that impression doesn’t turn into a view). Listen to the show to hear Brett’s example of a five-second video intro that helps uninterested viewers move on. Brett shares a strategy he used with his friend Ezra Firestone, co-owner of BOOM by Cindy Joseph, a successful ecommerce skincare line. They wanted to find people who purchased from BOOM but hadn’t bought BOOMSILK, a popular but relatively new product. In AdWords, they built a list of BOOM purchasers who had not bought BOOMSILK. Then they targeted this audience with an ad about BOOMSILK moisturizer. They know the audience loves BOOM and have bought in the past, and the list converts really well. Combine lists in custom audiences. To create a custom audience of existing customers, you can use a few different tools. With Customer Match, you can upload customer emails that you have permission to use. Google will try to match each email with one of their users so you can show them targeted ads. Other tools include the AdWords remarketing tag and a list you build in Google Analytics and then import into AdWords. To identify customers who didn’t purchase BOOMSILK, Brett and his team had to work with available data. You don’t have a way to integrate your email list seamlessly with your shopping cart. As a workaround, they identified existing customers who hadn’t visited the BOOMSILK product page. Create smart lists using the Admin section of Google Analytics. 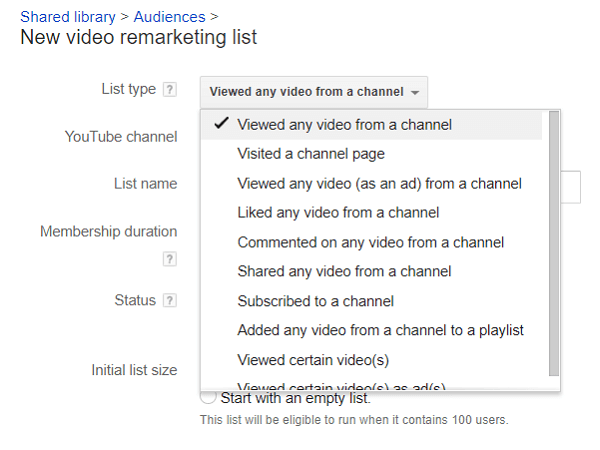 Another useful tool for building audiences to target is Smart Lists, a relatively new feature. To create a smart list, Google looks primarily at your conversion data and builds a list of people most likely to convert on their next visit. People on a smart list may not have purchased yet, but Google’s saying they’re hot prospects. To base a smart list on your own data, you need to have at least 500 conversions per month and at least 10,000 page views per month. (If you don’t have that level of conversions and traffic, your smart lists are based on similar businesses.) 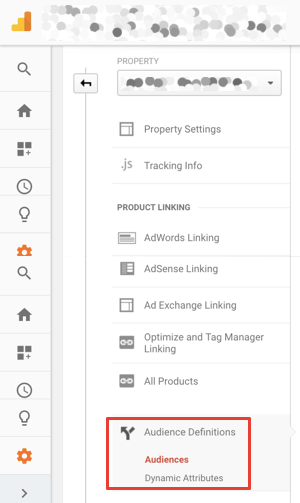 Also, to use the Smart Lists feature, Analytics and AdWords need to be connected and you need to enable Smart Lists in Analytics. After the Smart List feature is set up, you can build a list in Analytics and import it into AdWords. You can also target people on YouTube with a smart list. A third way to target potential buyers is similar audiences. For example, if you upload a list of your best customers, Google will find a similar audience. (This is akin to lookalike audiences on Facebook.) It’s also based on behavior. Google is saying, here’s your list, here are other people who searched in similar ways, visited similar sites, things like that. Because a similar audience isn’t true remarketing, Brett uses these audiences with a little more reserve and wouldn’t spend as much to show ads to similar audiences. He typically uses them with search ads. Listen to the show to hear Brett and I discuss the data and machine learning Google uses to build smart lists. Shoppable TrueView is the combination of YouTube TrueView ads and Google Shopping ads. You can run a video ad (for example, for a brand-new pellet grill) and right next to it they’ll show a product listing ad (PLA), also known as a Google Shopping ad, for grills or grill covers. 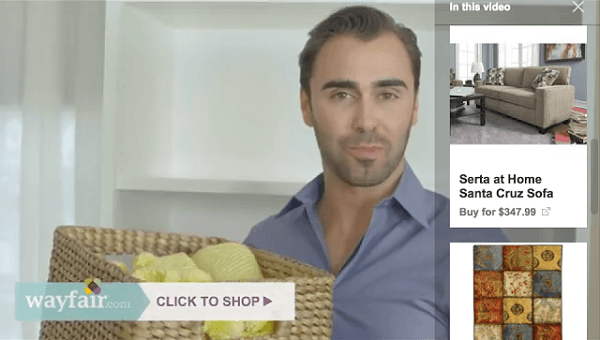 Shoppable TrueView matches Google Shopping Ads with your video ads. To use Shoppable TrueView, you need to set up the product feed with Google Merchant Center. You can tell Google to show only certain product listing ads or to open up the whole inventory. Listen to the show to discover how this tactic solves one of the frustrations with Google Shopping. A key pain point for many Instagram users is the inability to add carriage returns to create blank spaces above the list of multiple hashtags used in image descriptions of comments. Now, thanks to DisplayPurposes.com, Instagram users can create that white space. Simply click on the pink Copy Mode button, then type or paste in all of the hashtags you want to use under the bullet points in the white box you see. DisplayPurposes.com lets you paste in up to 30 hashtags. 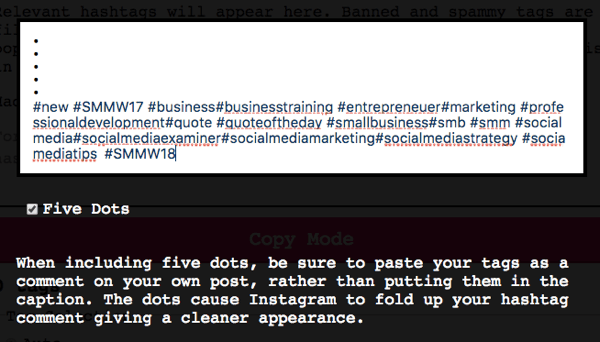 Select and copy everything in the white box, then paste it into an Instagram image description or comment. Copy the text in the box. DisplayPurposes magically inserts a carriage return behind each bullet point. Instagram post with carriage returns above the hashtags. DisplayPurposes.com is free to use. Listen to the show to learn more and let us know how DisplayPurposes.com works for you. Learn more about Brett on OMGCommerce.com and schedule a complimentary strategy session. Listen to the eCommerce Evolution podcast. Connect with Brett on LinkedIn. Read “The Ultimate Guide to Google Shopping” on Shopify. 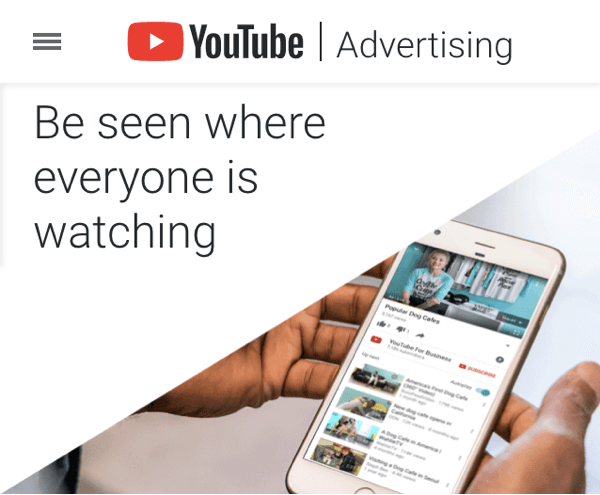 Learn more about YouTube ads, Google Shopping ads, and Shoppable TrueView. Explore AdWords, Google Analytics, and Google Display Network. Learn about targeting viewers on YouTube, different ad formats, and the AdWords planner. Get to know Ezra Firestone, co-owner of BOOM by Cindy Joseph. Take a look at Google’s Customer Match, Smart Lists, and similar audiences. Learn about Google Merchant Center. What do you think? What are your thoughts on YouTube remarketing? Please leave your comments below.